Our hearts are designed to beat at regular intervals and pump blood throughout our bodies. When the heartbeat becomes irregular, it is known as a cardiac arrhythmia. This can mean the heart beats too fast, too slow or at irregular intervals. Heart palpitations and heart murmurs are other names used to describe this condition. An irregular heartbeat can be harmless with no negative symptoms. However, it can also be a sign of more serious heart diseases that should be looked at by a board certified cardiologist. Seton Heart Institute Arrhythmia Center offers advanced care for irregular heartbeat and related conditions. Arrhythmias can be caused by genetics, as well as lifestyle choices that contribute towards heart disease. To lower the odds of developing an irregular heartbeat, you should make changes to your routine that will also help prevent other heart conditions. High blood pressure, diabetes and artery disease can all increase your risk of developing arrhythmias. Diagnosing exactly when arrhythmia is present can be tricky. Many arrhythmias have few or no symptoms, but have been known to cause lightheadedness, shortness of breath and chest pains. They can also lead to more serious problems such as heart failure, stroke or cardiac arrest (a heart attack). Tachycardia involves a heartbeat that is too fast, above 100 beats per minute for adults. Atrial or supraventricular tachycardia (SVT) is when this fast heart rate starts in the top chambers of the heart. Brachycardia is a slow heartbeat that does not reach above 60 beats per minute in adults. Palpitations can occur when the patient is abnormally aware of his or her irregular heartbeat. Palpitations can be both a symptom of arrhythmia and a separate specific medical condition. Atrial arrhythmia occurs when the heartbeat is irregular and often rapid. This stops blood from being directed to other areas in the body. The cause of this is an imbalance in the electrical impulses that drive our heartbeat. The impulses that regulate the upper chambers of the heart become out of sync with those that direct the lower chambers. This creates irregular beats that may be harmless, but can also lead to more complicated heart conditions. Atrial fibrillation is when arrhythmia occurs in the heart’s top two chambers (atria). Ventricular fibrillation is when arrhythmia takes place in the heart’s lower two chambers (ventricles). Depending on your type of arrhythmia, treatment may not be necessary. However, cardiac arrhythmias that need treatment can often be well-managed. Correcting your arrhythmia will depend on what type of heart problem you have. Some can be treated with medication, but more serious arrhythmias require other care. Our electrophysiologists offer an array of treatments that target the source of the arrhythmia, from pacemaker implantation to ablation procedures. Ablation: A catheter is inserted into the area of the heart that is causing the abnormal rhythm. The tube delivers energy that blocks the electric signal and stops the irregularity. Cardioversion: Electric stimulation is applied to the chest to restore your heart to its normal rhythm. Pacemakers: A pacemaker is a small device implanted into the heart. It senses your heartbeat, and sends a mild electrical impulse to correct an irregular rhythm. Usually, pacemakers are used for patients whose heartbeat is too slow. Implantable Cardioverter Defibrillator (ICD): Similar to a pacemaker, this device also detects when irregular heartbeats occur and corrects the rhythm. However, an ICD only acts in response to a life-threatening arrhythmia. While a pacemaker is a long-term treatment, an ICD is an emergency life-saving device. In some cases, your doctor may recommend surgery to correct your arrhythmia and other associated diseases. However, this is rare, and generally only happens if you are suffering from multiple heart complications. At Seton Heart Institute, our electrophysiology team is comprised of cardiologists, advanced practitioners, nurses, and technicians who concentrate on the comprehensive diagnosis and treatment of cardiac rhythm abnormalities. Patients undergoing implantation of an ICD (defibrillator) or a pacemaker at Seton Heart Institute have access to enhanced treatment monitoring and support through our specialized Device Clinic. With four locations throughout Central Texas, patients have convenient access to a dedicated team, meaning more timely appointments and better patient follow-up. Our team takes special care to educate each patient on their condition and treatment, resulting in improved compliance with therapy and better outcomes. Regular device checks are performed by mid-level practitioners every three to six months and adjustments are made as necessary to optimize therapy. In addition, we offer remote monitoring for many devices, which reduces the number of office visits required. We support a co-managed approach to patient care by providing consistent feedback to the patient’s primary cardiologist and coordinating with the heart failure specialists of Ascension Seton Heart Specialty Care and Transplant Center as needed. How your care can best be managed will depend on what type of arrhythmia treatment you had. If you’re taking medication to regulate your heartbeat, it’s important that you take it on schedule for it to be effective. Some arrhythmia medicines can have side effects as well. Communication with your heart doctor is necessary to make sure you’re getting the right dosing and are responding well to your treatment. 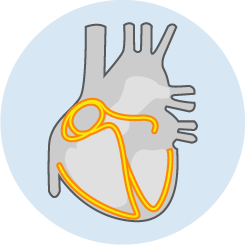 If you had an ICD implanted or are using a pacemaker, you will likely need to rest for several days after your surgery. Your doctor will give you specific post-op care instructions and things to be aware of with your device. Regular check-ups with your doctor will be important to maintain your device as well. Your device may need to be adjusted at certain intervals to give you the best treatment, and may need to be replaced if it ever malfunctions. Arrhythmias can range from unnoticeable to causing serious heart problems. Consulting with your doctor is the best thing you can do to see if your irregular heartbeat is cause for concern.